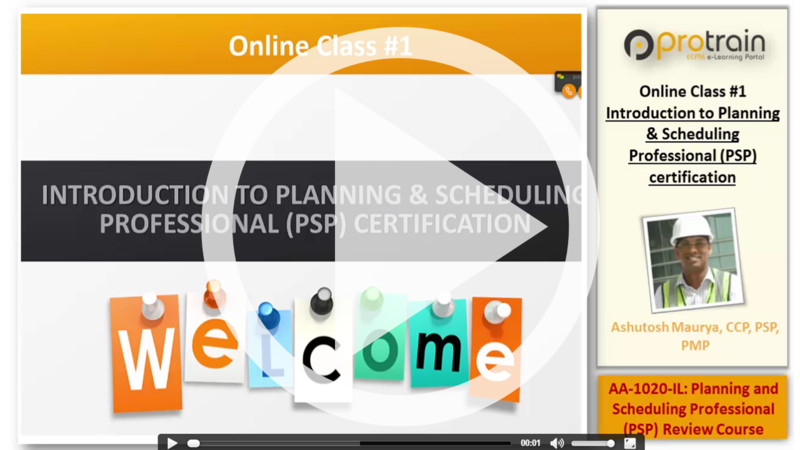 AACE International's Planning & Scheduling Professional (PSP) certification program is designed to establish credentials for the Planning and Scheduling Professionals. This certification program gives professionals a means to validate their skills and knowledge to international professional practice standards in the domain of project planning and scheduling. PSP certification will distinguish you as a Planning & Scheduling Professional who has the knowledge and skills those are required to ensure that the project time objectives are met. AACE's PSP certification provides an exam and experience validation that lets employers identify those who meet the program’s competency standards. In addition to help you prepare for PSP certification, this course will also provide you with comprehensive understanding of Planning and Scheduling skills and knowledge areas based upon AACE International body of knowledge. This course is based upon ‘PSP Study Guide, 1rd ed' and ‘Skills and Knowledge for Cost Engineering 5th ed’ both published by AACE International. This course is delivered through instructor led Online Classes, supported by Online Quizzes and an Online Study Group. Online Study Group helps to facilitate the students-to-students interaction and student-to-trainer discussions and knowledge sharing. Student can post all their queries for the trainer to respond, and discuss with the course participants. All study materials - lecture recordings, quizzes and discussion will be made available for the full subscription period of Six Months so when you will do your self-study for the certification all the study material will be available for your use. Course will start with detail introduction of PSP Certification followed by three knowledge modules - Module 1: Concept Overview, Module 2: Planning and Module 3: Scheduling. Protrain is an Approved Education Provider (AEP) of AACE International. This course has been approved by AACE International Education Board. Upon successful completion of the course we will issue you a certificate for 20 PDU that can be used to fulfill the maintenance requirements of other certifications. 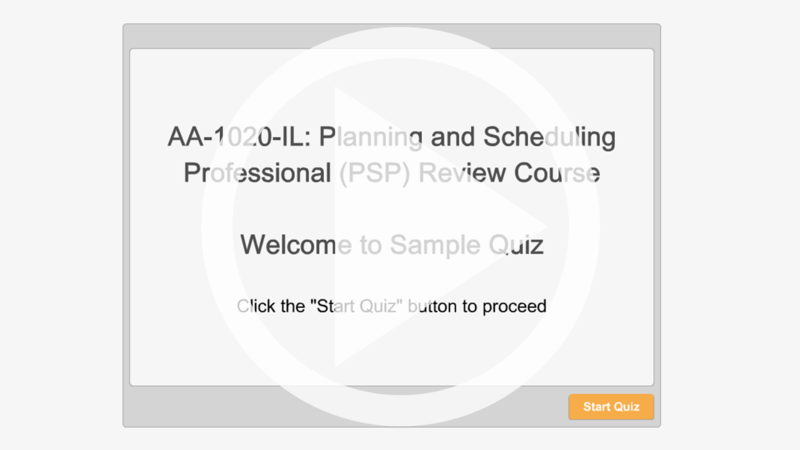 This course is intended both for those who are interested in becoming PSP certified, as well as, for those professionals who want to augment or brush up their Planning and Scheduling knowledge. Potential course audience would be Project Managers, Planning Engineers, Planning Managers Project Controls Managers, Project Managers and Cost engineers, and all those professional who are associated with project planning and scheduling. The course is also meant for professionals in the areas of administration and finance interested in gaining insight of project time management techniques. $300 (US Dollar Three Hundred Only). The Course Fee includes, Participation in all the Instructor-led Online Classes + Access to PSP Study Group + Quizzes + Access to the course recordings for the 6 Months period from the day of subscription. 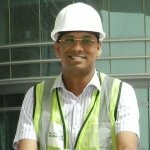 Ashutosh Maurya has extensive construction project management in India and Middle East. He has been associated with ultra mega multibillion dollars as part of projects core project management team. His total experience spans for more than decade, in this tenure he worked with leading contracting, consultancy and owner organization in India and Middle East. On the education side Ashutosh Maurya holds Civil Engineering degree from Govt. Engineering College Jabalpur and Master Degree in Construction Management from Indian Institute of Technology (IIT) Delhi. He is certified Project Management Professional (PMP) from Project Management Institute (PMI) and Certified Cost Engineer (CCE) from Association of Advancement of Cost Engineering (AACE) International. Ashutosh is a mutidisciplinary professional. While he is construction management professional by his education and day job profile, on the other side he proficient IT professional as hobby. Ashutosh is founder, architect and developer of Protrain.com. In spare time apart from reading tough topics of philosophy and management, Ashutosh love spending time with his wife, son and friends. Ashutosh is founder, architect and developer of Protrain.com. In spare time apart from reading tough topics of philosophy and management, Ashutosh love spending time with his wife, son and friends.